….It seems all the Brits finally have! Having friends in high places can be handy some times. A last minute call and I was off to Dover and Calais on Saturday morning (yesterday). The purpose of the trip?? not sure really just a bit of a boys day out and also a free P&O Ferries ticket helped. Saturday mornings aren’t great for truck spotting on either side of the channel, unless you are a lover Eastern European trucks, not a lot else really. A few Greeks (one above), a Portuguese version of Steve Marsh, a Mallorcan Volvo and some very disheveled Seafrance boats! Also not to mention that All 4 Trucks must have had half the fleet of an ex Hungarian State owned company, who now run yellow and blue trucks instead of green and yellow! There must have been 100 of them if not more. 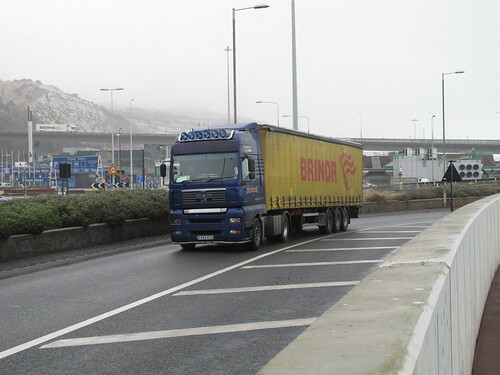 Once back in Dover there were only a handful (and no more) of British trucks arriving back on the lunchtime boats. So few in fact I will put them all on here. The best part of the spotting was the new exit lane from the Port for those heading for the M20. It comes out from the Port towards the round about, but just before it bears left round the back of the BP garage and under Jubilee Way, then out to join the road towards the M20 through Dover. The main idea being that it means all traffic exiting the port can keep moving and not have to get caught waiting at the roundabout. But it means that you can stand next to the new concrete wall next to the slip road and get a great view as the trucks are accelerating out of the Port. If you know the area you can probably picture what i’m talking about. Pity they haven’t built a windbreak from the channel wind though!! First up is this red DAF, pulling a plain blue curtainsider. Looks quite like an owner driver to me, do you know who’s it is?? 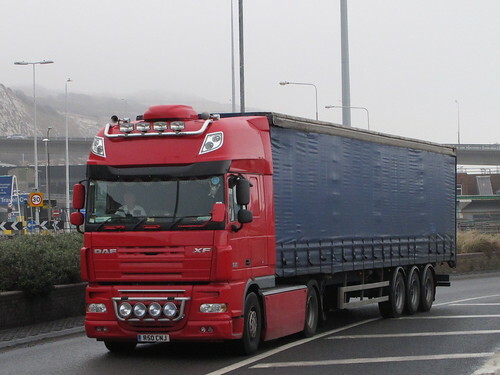 Email me, ben@truckblog.co.uk or leave a comment below. It’s relatively new as it’s got a Mont Blanc Euro 5 sticker in the windscreen. 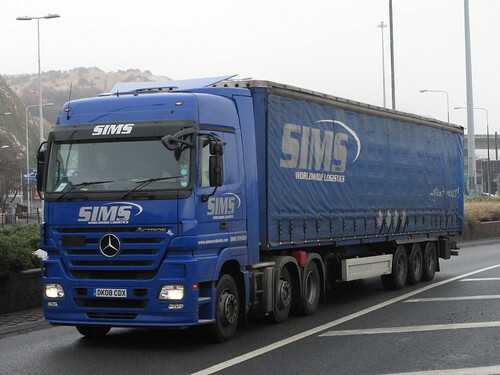 Next is Sims Worldwide Logistics from Manchester. A fair trek home on a Saturday afternoon, but i’m sure the Merc will make it a comfortable ride for the driver. A Brinor subbie, with a trailer that should be next of the refurb list! More curtain patches than a curtain shop, very loose back doors and wheels with more rust than bag of rusty nails! Anyone know about the MAN and the subbie?? This DAF looks like another well travelled owner driver. But could be a tricky one to work out; RHD, Dutch plates and UK – Swiss written on the trailer. Wheel trims, trailer toolbox, spare wheel carrier and bumper mudflap, well loved by the looks of it. Actually it has that classic long distance owner driver feel……in my opinion any way! 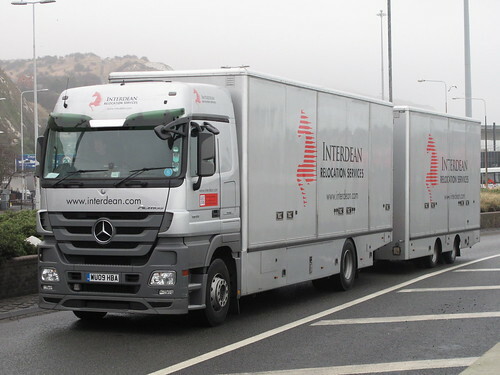 A very corporate but smart Interdean silver Mercedes drawbar. 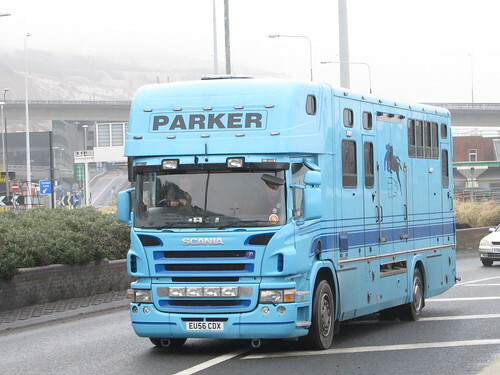 A light blue Scania horsebox? Yep your right, Parkers it is. Not one of the customised ones, but none the less, i’m sure it works just as hard. Note the additional lashing rings under the front bumper. Are these because its a horsebox or because the front grill has spotlights fitted?? Leave your thoughts below. 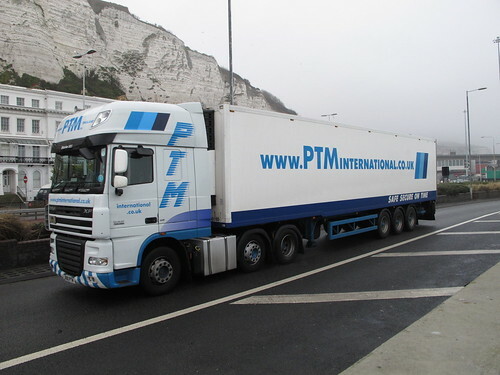 Saw a couple of PTM International trucks throughout the day, but I only snapped this one. 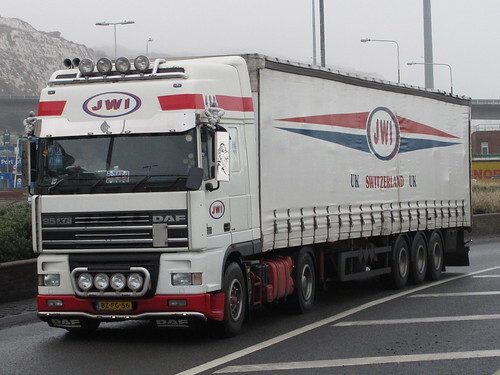 Does any one else get the feeling that DAF’s are the UK international hauliers truck of choice??? 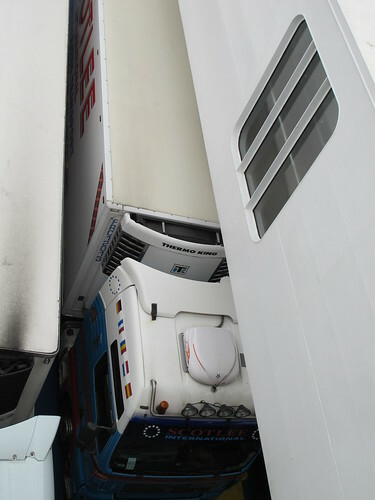 Finally under the rear outdoor deck on the Pride of Britain, was this well know Scottish haulier, Scotlee. The big ScotsMAN sitting quietly in front of the ever humming fridge unit. So that was my spotting day out. Thoroughly enjoyable and I have found some good spots to get some snaps, but I can’t help but feel that i’m at least 20 years to late!! 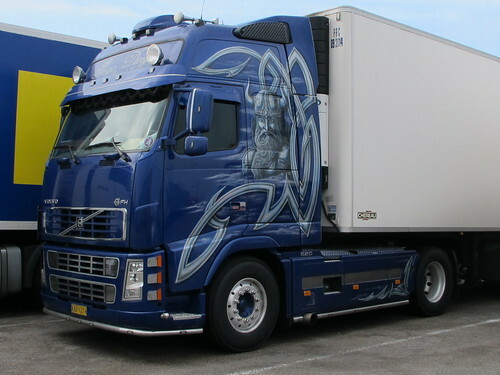 This entry was posted in DAF, International Mega Trucking, MAN, Mercedes Benz, Photos, Scania, Volvo by truckbloguk. Bookmark the permalink. Re Horsebox…Extra rings due to more chance of being “offroad” due to the job and easier to tow out with the John Deere/JCB/Fergy/MBtrac etc?? That is probably as good a reason as any young David.